I heard a puzzle the other day. At first it seemed pretty trivial, but the more I thought about it, the more interesting it became. It involves a deck of regular playing cards. The puzzle is based around a gambling game. 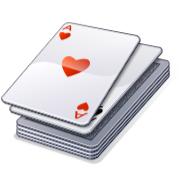 A deck of cards is shuffled then placed face down on a table. The cards are turned over one-by-one. You start the game with no money, and a running total is kept. You can leave the game and walk away with your cumulative winnings at any time. The question is, how much would you pay to play this game? Of course, to play the game optimally, we need to know what the optimal stopping strategy is. When should we quit and ‘bank’ our earnings? Quit too soon, and we might potentially leave money to be earned in the not seen cards as there might be long runs with a high saturation of black cards in the unseen portion. It’s impossible to lose money in this game! There are an equal number of black cards and red cards. 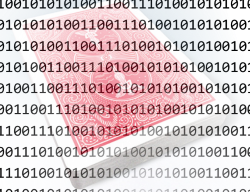 Even if things are going badly, you know that the last card to be turned up will net out the running count to zero. If things are initially going well, and you start by drawing a good percentage of black cards to build a strong positive score, the concentration of black cards left decreases making it harder to improve your score. Conversely, if you get off to a poor start, every bad card you draw increases the concentration of good cards left in the deck. Before you turn over the last card, you will know what it will be. You will always know this. (Potentially you will know what other cards are before the end are if you exhaust all of one color). The optimal stopping rule can’t be just one value (such as stop when you get to $x.00). It has to be function of what cards we’ve already seen. (As soon as even one card is turned up, it adjusts the probabilities of those left, so our strategy needs to be a function of our current score, and the number of each kind of card left). We can use this above fact to determine our optimal stopping strategy. After each card is drawn we know the current balance we have. All we need to do it is work out the expected value for the deck that is left. If the expected value of cards to come is lower than our current score, we stop. If the expected value is higher than our current balance, it’s better to continue drawing. Sure, we don’t know what the next card will be, we just know the probabilities. At each turn of the card we reassess whether we currently have more money than we’d earn (on average) if we continued. This is one of those great problems that we can solve with a recursive approach. Let's look a positions close to the end of the game, solve these problems, then see how we can apply this knowledge to situations earlier in the game. Imagine there is just one card left. We've turned over all the other cards. Since we've seen all but one card we know what the unturned up card is going to be. If the unturned card is black, this means that we must have already turned over 26 red cards and 25 black cards. This means that our running score must currently be −$1.00 (+25−26). We therefore should turn over this card as it will get our running total to zero and improve our position. The Expected value of this position is zero. If we play with optimal strategy, which is the take this last card, the best we can finish the game with is zero dollars. We can extend this logic with some careful thinking. If there is ever a time when there are zero red cards left (irrespective of the number of black cards), then the expected outcome of the game is zero! If there are no red cards left, it means we've already turned over every red card. We've taken a hit for every red card already. The best we can do is to turn over all the remaining cards (all of which are black). This will get us back to a score of zero on the last card. This is the best we can do. The expected outcome of this situation is zero. If there are no black cards left, it means that there are no cards left in the deck that can improve our score. Every turn of a card would lose us a dollar. We should stop playing. We also know what our score would be. Our score will be equal to the number or red cards outstanding (the number of unturned cards left in the deck). 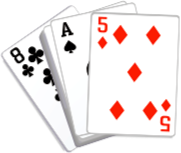 The expected value of this position is the number of cards left. We covered what would happen when there are just two black cards left (no red cards). That would be an expected value of zero. If there is one of each card left, there are two possible outcomes. You could draw a black card, or you could draw a red card. There is a 50:50 chance of either event. We already know the expected value when there is just one black card left, and when there is just one red card left. To compound the two branches (logical or operation), we add the expected values from each branch. Using this strategy we can calculated the expected value for any combination of red and black cards remaining. Now we have a way to calculate the expected outcome.  We also know that the current score at any position is the number of red cards remaining subtract the number of black cards remaining (the inverse of the cards already seen). If the current score at any position is higher than the expected value that could be achieved from that position going forward, we should stop and take the cash. If the expected value of continuing is higher, then it is in our best interest to continue drawing. Start in the top left corner. The math tells us that it is always in our interest to start to play to the game. The columns represent the number of red cards remaining. The rows the number of black cards. Draw a card and move either to the right or down the grid, reading the expected value as you go. As long as you are on a blue square, continue drawing (the number tells you what you might expect to win from this point). As soon as you move onto a green square, STOP! Bank the amount of money you have (which is the number in the grid). As you can see, if we adopted a simple stopping rule of "Stop when we get to $x" you can see how that would fail to take advantage of the changes of probability. Some non-intuitive results appear, for instance you can see that at if you were lucky enough to draw five black cards at the start, and thus have a score of $5.00, it's still in your interest to draw again. Even though there are just 21/47 chances of getting another black card (44.7%) which will put you up $1, cf. 26/47 chances of getting a red card (55.3%) which will cause you to lose a $1. Why is this? It's because, even if you draw a red card, there's still up to two more chances of getting to $6! $6 is the maximum value that can be earned if you play the optimal strategy. The expected value of the game at the start is just over $2.62, so this is the most you should pay to play the game. When there are 26/26 cards left, the expected earnings are higher than 25/25, which is higher than 24/24 … As you play the game, if you alternate between winning and losing, even when you get back to zero, your expected earnings drop with each levelling. As soon as you get into a green square, you should stop. If you continue to draw, the odds are against you, and whilst there is a chance you could improve, on average your score will move backwards. What would happen if, instead of adopting this dynamic strategy, we did apply a static rule of "Stop when we get to $x". What is the expected outcome? Choose a stopping value too high and, though you win big when it hits, it will not occur very often. Choose a stopping value too low and, though you'll get that money often, you'll be taking your winning prematurely, with potential earnings still in the deck. Here is a graph of the expected earnings based on static stopping scores. 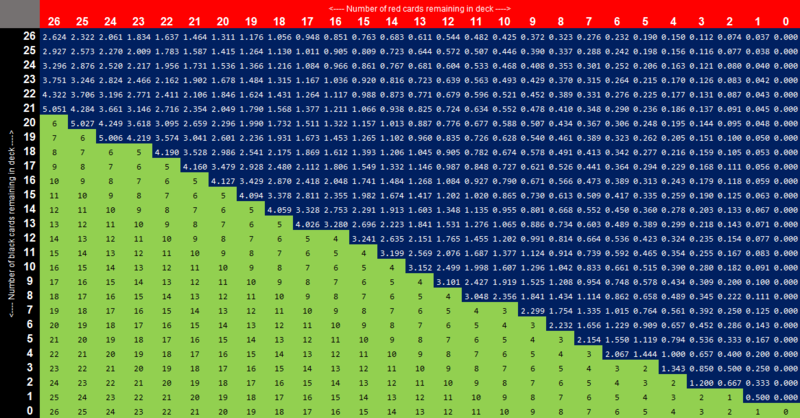 On the x-axis is plotted the possible stopping scores. e.g. Stop when you obtaining a total of $7 …. On the y-axis is plotted the expected earnings when averaged over a large number of games. This is smaller than adopting the dynamic strategy. (If you changed the rule to stopping at $5, over the long run you'd earn less than $2 per game).